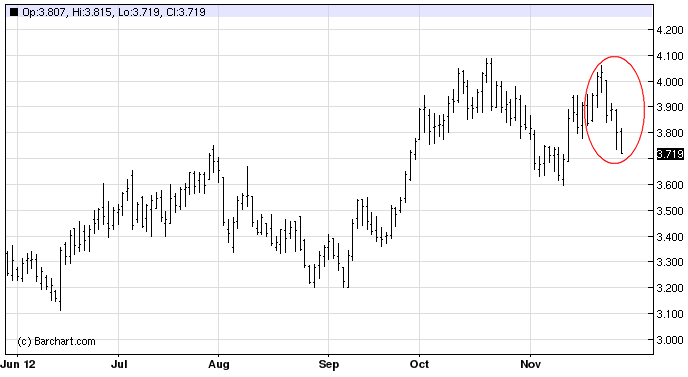 US natural gas sold of sharply in recent days, driven mostly by warmer weather forecasts. Bloomberg: - Gas dropped as much as 3.8 percent as forecasters including MDA Weather Services predicted above-normal temperatures for most of the lower 48 states over the next 10 days. Unusually cold weather helped reduce a supply glut this month. The December contract expires today. The declines however should be limited due to reduced nuclear power generation. A large number of nuclear plants have been down unexpectedly and it may take time to bring them online. 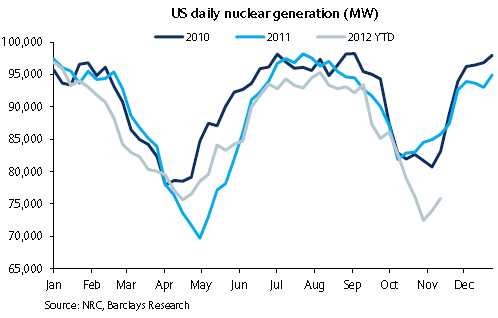 US nuclear generation is materially below normal for this time of the year, which should provide a floor to natural gas prices.